"Michael Clemons" redirects here. For the American development economist, see Michael Clemens. 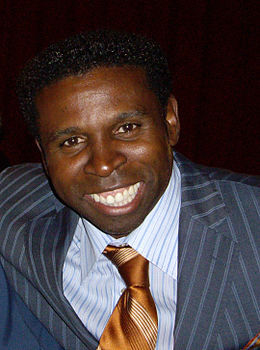 Michael Lutrell "Pinball" Clemons OOnt (born January 15, 1965) is an American-Canadian sports executive who serves as vice-chairman for the Toronto Argonauts of the Canadian Football League (CFL). Clemons played with the Argos for twelve seasons, and twice served as their head coach. His no. 31 jersey is one of only four that have been retired by the Argos. He is one of the most famous former Argos players, and is also one of the most popular professional athletes in the history of Toronto. Clemons has stated that he feels CFL football is the best football in the world. Clemons is 5 ft 6 in (167 cm) tall and weighs 170 pounds (77 kg). Clemons graduated with a degree in economics from the College of William & Mary where he played running back and return specialist on the football team, as well as playing soccer for a year. In his four-year college football career, he compiled 4,778 all-purpose yards and was named a Division I-AA all-American. In 1987, Clemons was drafted by the Kansas City Chiefs of the National Football League. During the 1987 NFL season, Clemons played in eight games, predominantly as a punt returner, where he collected 19 returns for 162 yards. When Clemons first joined the Toronto Argonauts in 1989, guest running backs coach Tom Cudney nicknamed him "Pinball" because of his running style. His diminutive size and extraordinary balance allowed him to bounce between defensive players much like a pinball inside a pinball machine. During home games, The Who song "Pinball Wizard" would play on the P.A. each time Clemons was involved in a great play. In his first game with the Argonauts, Clemons was named the player of the game. In 1990, Clemons received the CFL's Most Outstanding Player Award after setting a single season record for all-purpose yards (3,300). The following year, Clemons won his very first football championship as his Argonauts defeated the Calgary Stampeders to win the Grey Cup. Clemons went on to win two more Grey Cups as a player when Doug Flutie led Argonauts won back-to-back titles during the 1996 & 1997 seasons. In 1997, Clemons surpassed his own single season all-purpose yards record from 1990 by recording 3,840 all-purpose yards. This mark stood until 2012, when it was broken by Chad Owens. On September 15, 2000, Clemons played his last ever game as an Argonaut. During his 12-year playing career with the Argonauts he set many team records including career pass receptions (682), punt return yards (6,025), punt returns (610), punt return touchdowns (8), kickoff return yards (6,349), and kickoff returns (300). He also set single season single-season punt return yards (1,070 in 1997), punt returns (111 in 1997), and kickoff returns (49 in 1997). Clemons also amassed a career 25,438 combined yards during the regular season, a CFL record. In 2008, Clemons was inducted into the Canadian Football Hall of Fame. Upon ending his playing career, Clemons became interim head coach of the Toronto Argonauts in 2000, replacing John Huard, who resigned after compiling a 1–6–1 record. When offered the head coaching job by team general manager J. I. Albrecht, Clemons was reluctant to accept it, wanting to spend more time with his family. According to Clemons, "it was an awkward situation. After saying no, they said do us the favour of going home and discussing it with your family. The burden was that this team, this organization, had given our family so much that Canada was going to be our home. The Argos had everything to do with my family becoming a part of this country. Because of all I had been given I decided it was my time to reciprocate." As interim head coach, Clemons coached the Argos to 6 wins out of their remaining 8 games. He had the interim tag removed from his title at the end of the season. In November 2001, he was promoted to President of the Argonauts and relinquished his role as head coach in the process to Gary Etcheverry. When Etcheverry was fired as head coach on September 17, 2002, Clemons returned as head coach on an interim basis for the remainder of the 2002 CFL season. Clemons was officially given the head coaching job again on December 17, 2002, while also relinquishing his role as team president. He remained the head coach until 2007. Clemons was nominated for the Annis Stukus Trophy every year from 2002 to 2007, coming up short each time. In the 2004 CFL season, Clemons was the first black head coach to ever appear in a Grey Cup game. He became the first black head coach to win a Grey Cup championship during that same Grey Cup game, while also being the second black coach to ever guide his team to a pro football championship in North America. (Darren Arbet of the San Jose SaberCats was the first to do so in 2002 with an ArenaBowl XVI victory.) Clemons downplayed this milestone achievement, saying, "To tell you the truth, I don't know what it means to the first Black coach in the (Grey) Cup and to win it. I know that I can't do anything by myself, and on my own strength I'm very little good. Anything I accomplish has to be with the aid of individuals, and this team became like a family and is a family, it had very little to do with the colour of my skin". Clemons has the second most head coaching wins in Argonauts history with 67. (Bob O'Billovich is first with 89.) Clemons' record is 67–54–1 in the regular season over parts of seven seasons, with a 6–5 playoff record (including 1–0 in his lone Grey Cup appearance). As a coach, his nickname was often shortened to "Pinner" by his players. After retiring as head coach, he was vice chairman with Toronto in 2008. From November 2001 to September 2002, Clemons served as the team President. He ended his tenure as President to resume his second stint as the team's head coach. On December 4, 2007, Clemons stepped down as head coach of the Argonauts to become their new Chief Executive Officer. At the end of the 2008 Toronto Argonauts season, Clemons announced that he would no longer act in the day-to-day business of the organization and on May 6, 2009, Bob Nicholson was announced as the new president and chief executive officer of the Argonauts. On that same day, Clemons was appointed the Vice-Chair of the team. In his new role, Clemons advises the president & C.E.O. on key sales and corporate partner programs, significant community initiatives, and brand and media relations. Clemons was born in Dunedin, Florida to an 18-year-old single mother, Anna Marie Bryant, who had just graduated from a segregated high school. His father, Willie Clemons, lived an hour and a half away from them while finishing up his university education and later became a school teacher. Clemons started playing football at age 8 with the Dunedin Golden Eagles, a youth organization co-ordinated by the Police Athletic League. Clemons and his mother lived in public housing across the street from the city's sewer plant until he was 14 years old. At this point in Clemons' life, his mother married his stepfather, and would also become the first African-American to get an administrative job for the City of Dunedin. Clemons's mother was also a heavy influence in him becoming a devout Christian as she was also a clerk at a Baptist church in Dunedin. Clemons and his family currently attend the Meeting House in Oakville, Ontario. Clemons later founded a relationship with his father, Willie, during his college years. Even then, the relationship between him and his father was more like a nephew to an uncle, being limited to visits during his family vacations down in Florida and regular phone calls. Willie was also invited to the 2003 CFL Eastern Division semi-final game his son was coaching in Toronto vs. the B.C. Lions, marking the first time his father had actually seen him in any capacity with the Argonauts. Shortly afterwards, his father died. Clemons is also a motivational speaker, making frequent public appearances throughout the community. He is also a partner of the children's brand Simply Kids, a line of diapers, baby food and healthcare products found in supermarkets across Canada and the United States. Currently, Clemons resides in Oakville, Ontario with his wife, Diane (a native Floridian), and three daughters (who were all born in Canada). His oldest daughter, Rachel, is 22, his middle daughter Raven is 19, and his youngest daughter Rylie is now 14. Clemons has described himself (borrowing a quote from C.D. Howe) as an "American by birth but Canadian by choice". In 2000, Clemons became a permanent resident of Canada. It had once been suggested that Clemons had remained an American citizen to rebuff any calls for him to run for political office, such as for mayor of Toronto. Clemons was the subject of Pinball: The Making of a Canadian Hero (ISBN 978-0-470-83690-3) a biography written by Perry Lefko published in 2006. In April 2007, he visited Calderstone Middle School in Brampton to help start a reading program. On August 21, 2007, Clemons founded the "Michael 'Pinball' Clemons Foundation" which is dedicated to helping disadvantaged youth. On March 23, 2009, Clemons appeared on the CTV News @ 6 as a celebrity guest host to do the weather in celebration for Dave Devall's retirement. He is currently working with Marc Kielburger and Craig Kielburger, founders of Free the Children, in an initiative to build schools and clean water systems in Africa. On November 14, 2012, Clemons visited and gave a speech about life topics in Markham, Ontario for York Regional District School Board's annual QUEST Forum to promote Student Achievement and Well-Being. On February 28, 2014, Clemons visited the Scouts Canada National Leadership summit to speak about teamwork and working as one team to kick off the new program and strategic plan announcement. On April 28, 2015, Clemons officially became a naturalized citizen of Canada. Clemons was recognized on February 10, 2017 by the College of William and Mary, his alma mater, with an honorary degree during Charter Day ceremonies, where he also was principle speaker. From February 10–26, 2017, Clemons partnered with Global Pet Foods and Air Miles for the "Show Us Your Heart" event. Its goal is to raise money for homeless pets, rescue groups, and animal shelters across Canada through donations made at Global Pet Food stores. Voted one of the CFL's Top 50 players (#31) of the league's modern era by Canadian sports network TSN. Was inducted into the Canadian Football Hall of Fame in 2008. Was inducted into the Ontario Sports Hall of Fame in 2009. He was appointed as a Member of the Order of Ontario in 2001, giving Him the Post Nominal Letters "O.Ont" for Life. In 2012 in honour of the 100th Grey Cup, Canada Post used his image on a series of commemorative postage stamps. The image was also used on presentation posters and other materials to promote the Grey Cup game and other celebrations associated with the centennial. ^ a b "Individual Records – Combined Yards". Regular Season All-Time Records. cfl.ca. Archived from the original on January 19, 2010. Retrieved December 1, 2009. ^ Chris Pope. "Pinball Clemons Bleeds the Double Blue". The Good Point. Archived from the original on February 11, 2012. Retrieved November 12, 2008. ^ "The best PR man in the CFL". Hamilton Spectator. September 17, 2008. Retrieved October 5, 2008. 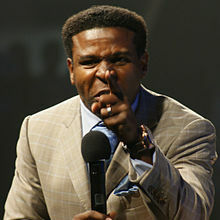 ^ "Michael "Pinball" Clemons". Front Office & Football Operations. Toronto Argonauts Football Club. Archived from the original on October 5, 2008. Retrieved October 5, 2008. ^ "Michael "Pinball" Clemons". Hall of Famers. Canadian Football Hall of Fame. Retrieved October 10, 2008. ^ Van der Voort, Jane (November 20, 2002). "DREAM JOB – Pinball Clemons: Passing back to the community". Toronto Sun. Retrieved October 5, 2008. ^ a b c d e f g inc., Canoe. "Heart of a champion". canoe.ca. Retrieved May 23, 2017. ^ Morgan, Nancy (September 16, 2001). "CFL's Clemons recalls growing up in Dunedin". St. Petersburg Times. Retrieved October 5, 2008. ^ "www.canada.com/topics/sports/story.html?id=d8a13c4a-2dfa-420b-8c60-9d0d04927d45&k=11834". Archived from the original on November 24, 2007. ^ Brunt, Stephen (November 16, 2007). "The most loved man in sports". Globe and Mail. Canada. Retrieved October 5, 2008. ^ "Pinball: The Making of a Canadian Hero". John Wiley & Sons Canada. Archived from the original on February 17, 2012. Retrieved October 5, 2008. ^ "'Guy stuff' on the reading agenda for new dad, son club". News Releases. Peel District School Board. April 2, 2007. Retrieved October 5, 2008. ^ WE (June 19, 2009). "Be the Change with "Pinball" Clemons". Retrieved May 23, 2017 – via YouTube. ^ WE (June 19, 2009). ""Pinball" Clemons' Real Heroes!". Retrieved May 23, 2017 – via YouTube. ^ "Pinball Clemons officially becomes Canadian citizen - Sportsnet.ca". sportsnet.ca. Retrieved May 23, 2017. ^ "Pinball Clemons: Proud Canadian Citizen". argonauts.ca. Retrieved May 23, 2017. ^ "Show Us Your Heart 2017 - Global Pet Foods". globalpetfoods.com. Retrieved May 23, 2017. Reinhart, Anthony (January 5, 2008). "What's up next for The Pinball Wizard? He sure played a mean football; now his fans want to see him take a run at office". Globe and Mail. Canada. Archived from the original on January 6, 2008. Retrieved September 8, 2017.